Chorley eased into the fourth and final qualifying round of the FA Cup with a victory every bit as comfortable as the score suggests. The gulf in quality between the clear leaders of the National North League and their hosts Peterborough Sports from the Southern Premier League First Division was clear to see. The Magpies, stamping their authority on proceedings in the opening quarter, were really never in trouble against a plucky side who at times gave the impression that they did not quite believe they could bridge that gap. Weather conditions and a poor playing surface threatened to spoil the game as a spectacle but Chorley were not inconvenienced and delivered a polished, professional performance crowned by a couple of superb goals. The visitors might have had two or three goals in the early exchanges. Marcus Carver was put clean through by Josh Wilson but saw his shot tipped to safety by Lewis Moat. The Sports’ keeper then denied the outstanding Courtney Meppen-Walter, getting the faintest touch to his thunderous 30-yards’ drive which cannoned off the bar. After that, both Wilson and Meppen-Walter had efforts cleared off the Peterborough line before Adam Blakeman extended his remarkable scoring run with a wonderful 20-yards’strike which rocketed past Moat and into the top corner of the net. Matt Urwin preserved the Magpies’ lead just before the break with an instinctive save at his near post from Sports’ talented Portuguese striker Avelino Vieira. Four minutes into the second half, Blakeman bagged his eighth goal of a productive season, his inswinging corner deceiving Moat who could only palm the ball into the net. A streaker unexpectedly braved the rain to interrupt play but the break did nothing to suggest that Sports could turn the game round. Although they never gave up, they could not find the deftness of touch to unlock the Chorley defence and pot-shots from outside the box flew harmlessly wide. A surging run by Meppen-Walter created the third goal which effectively ended the contest in the 74th minute. After waltzing past three challenges, he slipped a superb ball through for Carver to drill a low shot past the advancing Moat. 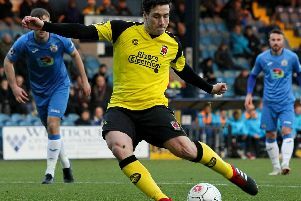 Sports’ left-back Dan Bucciero came close to a consolation goal with a fine strike in the last minute which whistled just over the Chorley bar. But in the final analysis there was no doubt about the classy Magpies’ right to pocket the £15,000 prize on offer to third round winners. CHORLEY : Urwin, Challoner, Blakeman, Teague, Leather, Meppen-Walter (Anson,73), Glynn (Whitham,61), Cottrell, Carver, Wilson (Lazarus,73), E.Newby. Unused subs. O’Brien, Jordan, Almond, Eccles. Att. 404 (new club record).